The joint degree program in Canadian Common Law (JD) and Indigenous Legal Orders (JID) welcomed its first intake of students in September 2018. It is the first program of its kind in the world. Combining intensive study of Canadian Common Law with intensive engagement with Indigenous laws, the JD/JID will develop the skills needed to practice within Canadian Common Law, with Indigenous legal orders, and at the interface between them. Students graduate in four years with two professional degrees: a Juris Doctor (JD) and a Juris Indigenarum Doctor (JID). They will have a deep understanding of Indigenous law and governance, the academic qualifications to pursue a career in Canadian Common Law, and a strong sense of how to create and manage institutions functioning across both spheres. The Indigenous Legal Lodge is a national forum for critical engagement, debate, learning, public education, and partnership on Indigenous legal traditions and their use, refinement, and reconstruction. The Lodge will house both the JD/JID program and the Indigenous Law Research Unit, conduct research on Indigenous Law, and stimulate discussion and engagement with Indigenous legal orders throughout Canada. It will serve as a global centre of excellence on Indigenous and customary law. For more information, click here. The JD/JID will combine classroom learning with facilitated field study conducted in collaboration with Indigenous communities. Students will obtain the full content of UVic’s Common Law degree (JD), together with greatly enhanced skills to work productively with Indigenous legal orders. The following are the core elements of the proposed program. The JD/JID program will be a four-year program (one year more than the JD alone). In this respect it resembles the McGill Program, which, over the course of four years, provides students with two degrees, one in the Common Law and the other in Civil Law. Important elements of the program, especially core first-year subjects, will be taught transsystemically – through intensive, mutually-illuminating comparison in courses that deal with Canadian law and one or more Indigenous legal traditions. The credit weight of those courses will be increased to make room for the comparative treatment. Two of what are, in the JD curriculum, first-year subjects will be studied in second year. One compulsory upper-year course, Coast Salish Legal Studies, will introduce the legal tradition of this region, using legal categories drawn from that tradition and exploring how those categories are related to concepts within Coast Salish languages. Upper-year courses, elective and compulsory, will be drawn from the JD curriculum and newly-created specialized courses designed to complement the JD/JID. A crucial dimension of the program is its field schools. Students will devote one full term in each of their third and fourth years to study in Indigenous contexts. Students will, under close academic supervision, learn from community-based experts on a particular Indigenous people’s legal order, observe the ways in which Indigenous legal processes are being employed today, and work with the community on law-related projects. The study will be sufficient for students to acquire an understanding of the institutions, sources of law, forms of reasoning, principles, and procedures particular to that Indigenous people’s law. The program cannot, of course, provide comprehensive training in every North American legal order. The program will work with a sampling of Indigenous legal traditions chosen to address the three categories of North American Indigenous peoples (First Nations, Inuit, and Métis) and to provide grounding in a range of modes of Indigenous organization and institutional forms. Taken together, the JD/JID program courses will introduce students to a range of areas of law of Indigenous peoples: governance, responses to harms and injuries, child welfare, familial responsibility, land tenure, land management, and others. The program does not seek to replace the knowledge of law and the institutions held within communities. Instead, it seeks to train students in how to work productively with Indigenous principles and procedures, often with the principles and procedures of students’ own Indigenous peoples; to interact in a good way with those who possess knowledge within communities; to help build institutions that are grounded in the people’s principles and procedures; and to construct appropriate modes of interaction between Indigenous and non-Indigenous institutions and peoples. It seeks to train professionals to work constructively with and assist in empowering communities, not displace them. The JD/JID program is limited to a class of 25 students with an intake in September of each year. The first intake of students is September 2018. Online applications are now closed and will re-open on September 1. You are encouraged to submit your application and supporting documentation as early as possible. Typically, you need to choose to apply to either the JD/JID program or the JD program, rather than apply to both programs. If your application to the JD/JID program is denied, the Admissions Committee may invite you to apply to the JD program. The JD/JID program is made possible by our treasured relationships with the Songhees and Esquimalt peoples, on whose lands the University of Victoria is located, the W̱SÁNEĆ people, who have longstanding connections to this land, and Indigenous peoples from coast to coast to coast and around the world. It builds upon our longstanding commitment to and international reputation in Indigenous law and Indigenous legal education. The program was conceived by two of Canada's leading Indigenous scholars: John Borrows, Canada Research Chair in Indigenous Law, and Val Napoleon, Law Foundation Chair in Aboriginal Justice and Governance. Its development has benefited from the strong support of faculty and staff throughout UVic Law and been greatly assisted by networks of Indigenous scholars in Canada and internationally. UVic Law is the home of the Canada Research Chair in Indigenous Law held by John Borrows; the Law Foundation Chair in Aboriginal Justice and Governance held by Val Napoleon; the Indigenous Law Research Unit (ILRU); LLM and PhD programs that have trained many of the next generation of researchers in this field in Canada and around the world; the Akitsiraq program, which delivered a full JD to a cohort of Inuit students in Iqaluit (2001-05); the Aboriginal Cultural Awareness Camp, which has introduced first-year students to Indigenous peoples and their legal orders for more than 22 years; some of the earliest and best-developed support systems for Indigenous students in the country; a consequent record of success in training Indigenous LLB/JD students (more than 200, many of whom hold leadership roles throughout Canada); and, in collaboration with the Gustavson School of Business, the National Consortium for Indigenous Economic Development. The JD/JID program and the Indigenous Legal Lodge directly respond to this Call. 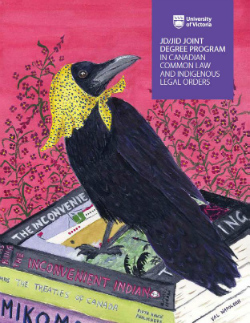 The JD/JID program has been under discussion and development at UVic Law since 2004 – the product of pilot projects, experimentation, research, deliberation with Indigenous peoples, conferences, and consultations with many parties. It has the support of Indigenous organizations, law faculties, political leaders, professional organizations, and enterprises across Canada and worldwide. Support the University of Victoria Indigenous Law Program and the development of the Indigenous Legal Lodge. Direct the Assembly of First Nations (AFN) to respectfully call upon the Government of Canada to support the establishment of the University of Victoria's Indigenous Legal Lodge and for delivering the transformative Indigenous law program, including both the Common Law (JD) and Indigenous Legal Orders (JID) degree programs. To view the full text of the resolution, look for #5 on the resolution document. A graphic narrative on Cree criminal law. Toolkits on gender and matrimonial property on reserves. Ideas on CBC Radio: Pushing the frontiers of knowledge: The 2017 Killam Prize. CBC News BC: Prestigious award for leading researcher in Indigenous law. Power & Influence Op-Ed: An emphasis on Indigenous law could help shape a future that's brighter than our past. Globe & Mail: UVic proposes joint Indigenous-Canadian law degree. Indigenous Law Video on Demand: Rebecca is interviewed in several videos, created as part of an Indigenous Law Research Unit project. Reconciliation Syllabus, a collaborative blog to support recommendation #28 of the TRC Calls to Action, led by Prof. Rebecca Johnson. Click here for the JD/JID program FAQs.